czy jak mam serwer od 5 miechow to mam 5% rabatu? Rabat lojalnościowy naliczany jest od dziś. W sprawie ustawienia nowej ceny za serwer prosimy o napisać temat w Helpdesku. Tylko wybranym :) Polecam zakładkę Kontakt. Czy zmiany w konfiguracji serwerów 1.6 zostały wprowadzone także na te kupione wcześniej przed publikacją newsa? Tak. Wszystkie serwery odpalamy z 1000FPS / PB3 już od dłuższego czasu. ten własny adres ip gdzie wykupić?? Nie czyta mi wgl serwerów, w grze ani w panęlu co jest? Dlaczego używacie tego tematu jak Helpdesku od tego macie właśnie taką opcje. Jak wyglądają parametry nowych maszyn no i oczywiście ile slotów stawiacie na takiej maszynie ?? 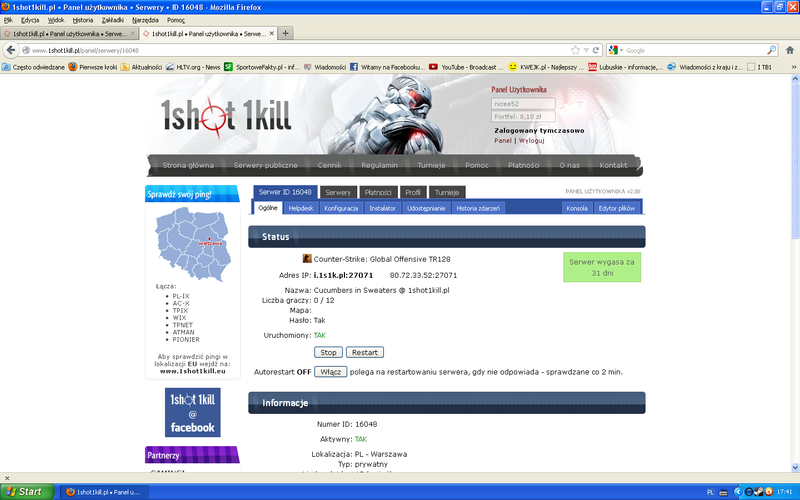 Zakupiłem serwer cs:go "ID : 16048; IP: 80.72.33.52:27071". W "instalatorze" zainstalowałem "steam update" oraz "Esl plugin", po czym zrestartowałem serwer. W podglądzie ogólnym pokazuje, że serwer jest uruchomiony, a jego nazwa to "Serwer nie odpowiada". Jedno przeczy drugiemu... (załącznik #1). Po jakimś czasie, podgląd ogólny serwera, że tak powiem się zregenerował, lecz nie było widać mapy... (załącznik #2). Jakiekolwiek próby dołączenia na serwer kończą się niepowodzeniem (załącznik #3). Ponadto w zakładce "serwery publiczne" próbowałem dołączyć na wasz publiczny serwer cs:go, który również nie działa ! Zaczyna mnie to irytować, ponieważ czas leci, a serwer "niby uruchomiony" stoi bez możliwości grania. ja tak samo, kiedy będzie się dało grać? Panowie mają coś nie tak z panelem instalacyjnym, nie mogę zainstalować z panelu amxmodx, a gdy to zrobię serwer mi pada. Gdy instaluję ręcznie, serwer zawiesza się przy wejściu na niego, chyba, że w modułach wyłączę cstrike. Żadna z wersji amxmodx nie działa na serwerze od państwa. Czekam już 2 dzień na odpowiedź w helpdesku. Podpisuje się pod postem #16, z tym że mój serwer to hltv i cały czas jest tak jak u kolegi na 1ss. Dwukrotnie już pisałem w helpdesku i nikt nie odpisuje, a czas serwera leci. Siema to ma sie rozumiec ze teraz kazdy serwer ma 1000fps? 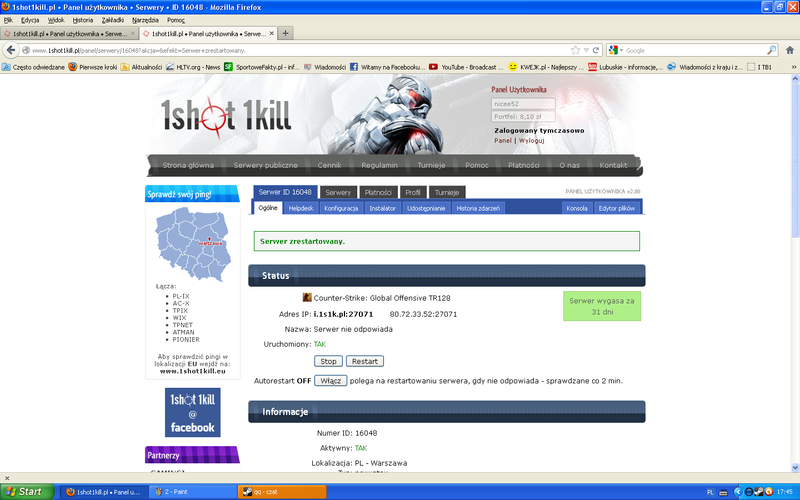 np serw cs 1.6 11 slotow prywatny za 22zl ma 1kfps? Mam problem z włączeniem serwera, jak również wejściem na ftp, serwer nie odpowiada, proszę o wszelką pomoc. American <a href="https://www.coachoutletwebsite.com/"><strong>coach factory website</strong></a> Pharoah led all the way to win the Belmont Stakes by 5 1/2 lengths on Saturday, becoming the first horse since 1978 to sweep the Kentucky Derby, Preakness and Belmont Stakes one of the sporting world's rarest feats. "Wow! Wow!" jockey Victor Espinoza said moments after crossing the finish line. <a href="http://www.cheapcoachwallet.us"><em><strong>coach factory outlet online login</strong></em></a> "I can only tell you it just an amazing thing." The bay colt with the unusually short tail easily defeated seven rivals in the grueling 1 1/2 mile race, covering the distance <strong><em><a href="http://www.outletstorescoachonline.com">Coach Outlet Store Online</a></em></strong> in 2:26.65 to end the longest stretch without a Triple Crown champion in history. American Pharoah is the 12th horse and first since Affirmed in 1978 to win three races on different tracks at varying distances over a five week span. He won <a href="http://www.coachfactoryonlinesale.us"><em><strong>cheap coach purses</strong></em></a> the Derby by one length on May 2 and then romped to a seven length victory in the rainy Preakness two weeks later before demolishing his rivals Saturday. "I still can't believe it happened," said Baffert, at 62 the second oldest trainer of a Triple Crown winner. "I <strong><em><a href="http://www.outletscoachfactoryonline.com">click here</a></em></strong> was prepared for somebody coming because I've been through this so many times," Baffert said. Sent off as the overwhelming 3 5 favorite, American Pharoah paid $3.50, $2.80 and $2.50. "I feel so good," Espinoza said, "I say, 'I hope American Pharoah feels like me.'" Frosted returned $3.50 and $2.90, while Keen Ice was another two lengths <a href="https://www.coachwebsitefactorylogin.com/"><strong>coach factory store online</strong></a> back in third and paid $4.60 to show. "He's as sweet as a horse you'll ever come by," Zayat said. "You could bring kids up <a href="http://www.storeonlinecoachcheap.com"><em><strong>coach outlet store online</strong></em></a> to him, and he'll just put his head on them. He knows who he is. I call him a humble champion." A sign with American Pharoah's name and silks was quickly put up in the <a href="http://www.silverfishing.com"><em><strong>coach handbags outlet</strong></em></a> infield next to the 11 other Triple Crown winners. The crowd of 90,000 capped to avoid overcrowding and long lines from last year's total of 102,199 roared as American <a href="https://www.factoryoutletscoachlogin.com/"><strong>coach factory online sale</strong></a> Pharoah turned for home in front. Five of his rivals lost to him in the Derby, then <a href="https://www.coachstoreonlinefactory.com/"><strong>Coach factory outlet website</strong></a> skipped the Preakness to await the Belmont, a competitive advantage to horses that didn't endure the three race grind. Tale of Verve finished second in the Preakness to American Pharoah, who had beaten Madefromlucky in the Rebel Stakes in March. http://www.travelegg.org	Whenever we have been suddenly enduring driving conditions that can be not standard to us all, we should certainly adjust as a way to conditions. The preferred rule in relation to adjusting as a way to changes contained in the road conditions is always always drop. You won't have control with the vehicle if you happen to continue traveling from the identical speed that the road afflictions change.